Aam Panna or the green raw mango drink is considered as a health tonic which should be taken at least once in a day during summers. If you are still having those ready-to-drink aam panna, shun it right now. Raw mangoes are already in town and you can make fresh mango drink out of it ‘with no added preservatives’. I loved these bowls and have them too in my kitchen. You can buy from here and help me earn a bit from this piece to run my blog. The temperatures are already fluctuating with 42-43 degrees in northern India; I know because of dust storms there is a dip in temperature yet the sun is quite strong. If you have afternoon shift timings, the heat stroke won’t spare you. Oh! I’m not scaring you, although I sounded like 😀 . Aam Panna is the best drink to have in summers. The cooling factor in this health drink keeps you going and fights the summers’ effect on your body. The heat in summer season takes off most of the water and salt from your body through sweating. To cope, you need water. Aam ka Panna helps you in keeping hydrated; it’s rich in anti-oxidants, Vitamin C and iron. Helps in fighting the indigestion and the diseases related. It helps in keeping the stomach cool. Aam Panna helps in fighting against diabetes and its effects. It’s a good tonic to be had if one is suffering from dysentry, tuberculosis and cholera. It tastes great. So drop all those cold drink cans from your hand if your still having one and step in to make this healthy, tangy and with lots of water cool and refreshing drink. Just like watermelons, my mum used to make Aam ka panna in Summer season and she would give it to us every day, without fail. Another benefit of having aam ka panna or the raw mango drink – if you suffer from heat stroke, have aam ka panna at least twice. Don’t throw the mango rind, instead rub it on the palm and soles. That’s a home remedy to fight heat stroke. Earlier, Aam ka Panna recipe involved roasting of the raw mangoes over fire or in earthen stove. The panna has much different taste when mangoes are roasted but nowadays it’s something next to impossible. 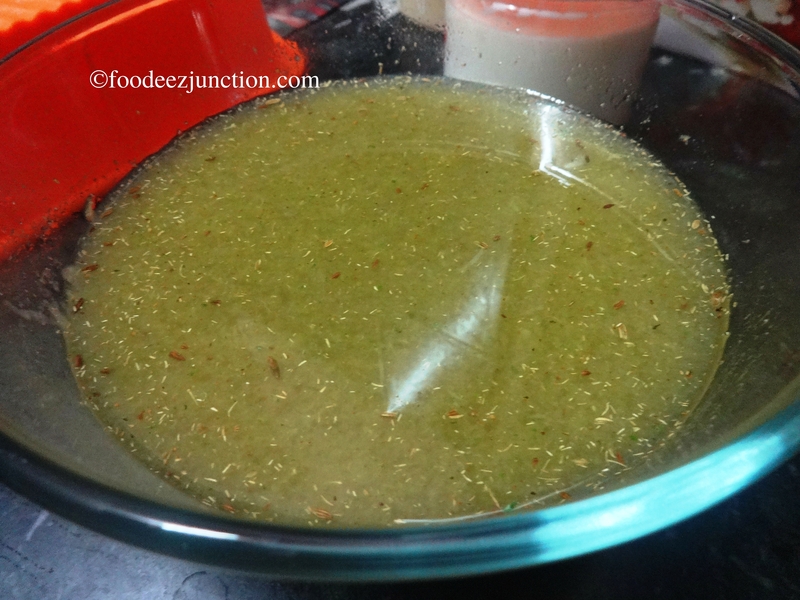 So here is the recipe for aam ka panna with boiled mangoes. Take a deep pan, add enough water to sink the mango. Now out the raw green mango in it and cover the pan. Put it on high flame and bring the water to boil. Lower the flame and cook the raw mango for 15 minutes. Switch of the flame, remove the pan from the stove. Let it sit for 5 minutes and now take out the mango. Wait until it cools down. 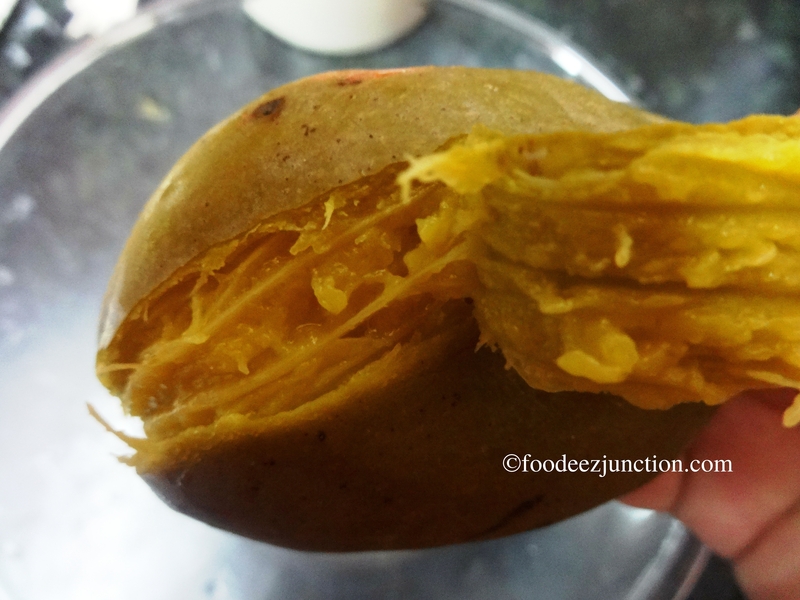 Remove the mango skin with the help of your fingers. Take out the pulp with the knife and keep it in a deep bowl. I used fingers. Mash the pulp with a spoon, lightly whisk to make it a smooth yet coarse paste. Keep this aside. Take a pan, add zeera and saunf to it and roast it on the stove for 20 seconds. 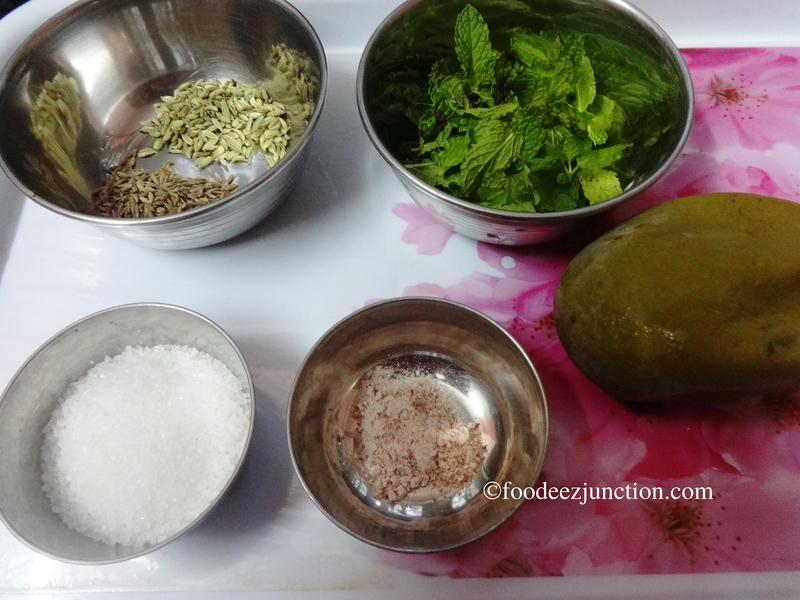 Put the roasted zeera and saunf seeds in the blender, add black salt, mint leaves and sugar. Grind it for 30 seconds to a coarse paste. Now add 1 tbsp mango pulp from the boiled mango pulp bowl. Grind it again to make it a smooth paste. Add this paste to the bowl of raw mango pulp. Mix it with a spoon. Add cold water, up to 2 1/2 glasses and stir again. You can add ice cubes too but in the bowl itself. Stir. 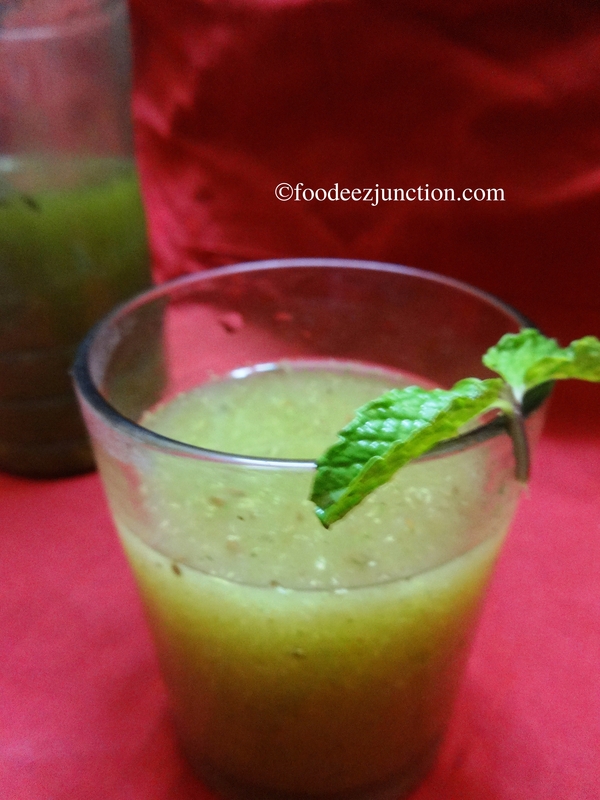 Serve the Aam panna in glasses and have it chilled. You can store it in a glass container or jug for a day. You can boil as many mangoes as you want all together and store in the refrigerator for 5-6 days to make the Aam panna through this recipe later. Instead of sugar, you can use jaggery; it should not have impurities – pick one from a nearby store. True Nilanjana. It gives an earthy flavour to Aam panna. Making this summer drink with roasted mangoes is authentic; I had mentioned in my recipe. But boiling is no less in taste 🙂 .. let me know how you find it. Haha … I love it too.. it’s a wonderful drink for summers 🙂 I’m glad you liked the pictures!